After leaving University in 1855 Morris made himself apprentice to G.E Street, a gothic revival architect, where he developed his drawing skills sketching the elaborate details of buildings. He was hugely influenced by Dante Gabriel Rossetti, who was a member of the Pre Raphaelite Brotherhood and a close friend. It was Rossetti who convinced Morris to take up painting and to leave architecture behind. Morris was not at all fond of figurative work however and preferred to paint images inspired by literature. 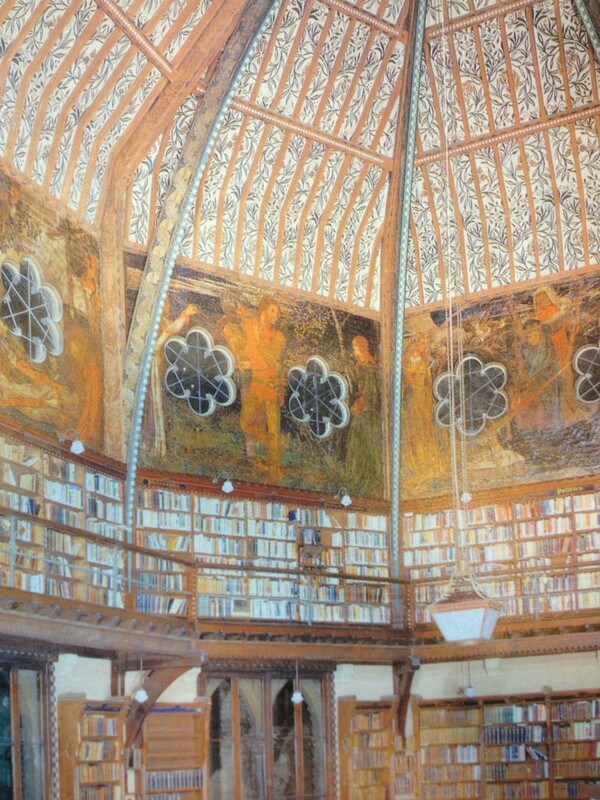 For example in 1857 Morris along with great friends Edward Burne-Jones and Rossetti were commissioned to paint a mural in Oxford Union Society’s debating hall (Picture 1.) – now the library. Morris took inspiration from the story of Tristram and Iseult, painting imaginary scenes and went on to decorate the ceiling with a leaf and flower design – a hint at his future work. He had a wide range of interests and was keen to master all kinds of crafts including costume design, stone masonry and woodcarving. After his marriage to Jane Burden, Morris and his friends set about decorating Red House, his marital home, designing tiles for the fire places, furniture, tapestries and painted scenes for the walls. Jokingly afterwards Morris and his friends decided to set up The Firm – Morris, Marshall, Faulkner and Co to commercially decorate buildings. The company also included Burne-Jones and Ford Maddox Brown another member of the Pre Raphaelites who was familiar with stained glass design. The Firm aimed to revive medieval techniques and show the artists hand in the finished product. Morris’s first wallpaper designs Trellis, inspired by the garden at Red House and Daisy based on a wall hanging he and Jane made, were strangely unpopular during the mid 19th century, perhaps being a little too modern or naïve in their design. But then in 1860 decorative arts become more popular and The Firm’s reputation was saved by two important commissions from St James Palace and South Kensington Museum – now the V and A (Picture 2.). After visiting Iceland Morris became inspired once more to continue his wallpaper designs and over the course of four years produced seventeen intricate and beautiful patterns including Larkspur, Marigold and Jasmine all inspired by the natural world and medieval literature. His drawings are so full of life that they are continually exciting to look at and though based on figurative objects they suggest fantastical and fictional realms. With much experimentation using vegetable dyes, which Morris was a firm advocate of, he progressed on to fabrics or Chintz and carpets all the while remaining a prolific writer and poet. Towards the end of his life Morris became a firm socialist campaigning for the rights of the working class who were severely deprived at the time. He even continued working whilst he was ill setting up the Kelmscott Press in 1891 learning how to make paper, bind the books and even designing the type fonts himself. Two copies of the Kelmscott Press were released before his eventual death from diabetes in 1896. Prolific and eccentric to the end William Morris reminds me somewhat of my grandfather which is why he will always be doubly inspiring to me.